It was on Mother’s Day (21 March) 30 years ago that Egypt’s prominent gynecologist Mohamed Aboulghar started, with a group of medical doctors, Egypt’s first ever centre for in vitro fertilisation (IVF). This was about 10 years after the world’s first IVF baby was born in England and a couple of years after the first IVF centre was inaugurated in the Middle East, in Israel. It took Aboulghar a few years of research and contacts with IVF specialists in Europe and the US before he managed, with the help of a colleague from the medical school of Cairo University, Ragaa Mansour (who had just finished training on IVF techniques at the University of Ohio) and a third doctor, Gamal Sorour, to actually get started in Egypt. “It was revolutionary for sure — a major scientific development that opened new avenues of hope for keen couples who had to otherwise put up with the harsh challenge of infertility,” Aboulghar remembered. It was also, in a sense, a social shock. “Couples had issues being open about their infertility. They felt it was something to be ashamed of. They even felt they had to hide it from their own parents,” he said. To make things more difficult, Aboulghar recalled, the introduction of IVF in Egypt faced considerable resistance from conservative and ultraorthodox religious figures, both Muslims and Christians. Aboulghar and Sorour, who was a professor at Al-Azhar University, had to go through rounds of contacts with leading religious figures on both sides to secure their support and to help stop the anti-IVF campaign that was being launched at the time. “In fact, many colleagues were apprehensive about our efforts. They were not sure that we would succeed, even though we had imported all the necessary equipment and medical requirements,” he said. Aboulghar added that for about a decade after the inauguration of this first IVF centre in Egypt, couples who were willing to acknowledge that there was a "problem" were not comfortable pursuing IVF. “Taking medicine or pursuing some surgical procedure was alright, but not much more,” he said. “I remember a couple used to want to hide, almost as they entered into the centre. They were very anxious about meeting other couples in the waiting room,” Aboulghar recalled with empathy. “I think it was in the early 1990s that things started to change. Not so much because of the many successful cases where IVF helped couples have the babies they hoped for, but also because the stigmatisation of infertility was knocked down by the desire to have children,” he said. According to Aboughar, today it is not just easier for society, that learned to accept that some couples need to resort to advanced medical techniques to be able to have children (“early on it was just women’s infertility that we were able to help, through IVF, but later also men’s infertility through ICSI“), but it is also easier for doctors who in earlier years had to work in challenging conditions, before scientific research allowed for breakthrough in machines and medicines related to the process. In July 1987, Aboulghar and his team saw the birth of Egypt’s first ever IVF child: a baby girl named Hebattoullah (a gift from God). At the time, the birth of this "revolutionary" baby girl was front page news in all leading dailies in Cairo, and her story was celebrated by hopeful couples for years before it became "normal" for couples to pursue IVF or ICSI. Now, thousands of couples every year find treatment in some 50 plus private fertility centres, along with a few government units, operating in Egypt. “We used to see Hebattoullah for her birthday every year, for almost 13 years. But then she went on with her life, as many other girls and boys were born to parents who pursued IVF,” Aboulghar said. 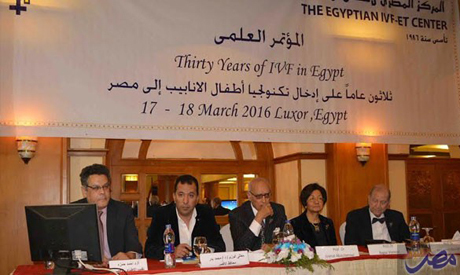 Back in the early days of IVF in Egypt, the process used to cost the couple around EGP 2000. “Quite a bit of money for that time,” Aboulghar recalled. Today, on average, it costs about five times more. “Unfortunately it remains a very costly process for the vast majority of people, and there is no chance in the future, certainly not in the near future, to see the treatment of infertility covered in the medical care the government provides – not with such a limited budget for healthcare and with so many serious diseases to attend to,” Aboulghar said. In the centre he co-established three decades ago, Aboulghar is giving economically disadvantaged women hope to access IVF by allowing donations from economically privildged couples who manage to go through the process successfully and have a baby or two. “We ask the couple to either nominate another couple for financial help, or we put them in touch with a candidate couple,” he said. “And this has been helping, for sure,” he added. According to this leading Middle Eastern name of reproductive endocrinology, the road of the past 30 years has not been easy for women. It is the wife who is always the first to be blamed by family and society when a young couple fails to promptly have children. And when medical treatment was made available, husbands would decline to do the necessary medical check-ups, to decide the medical path away from infertility. When IVF was finally available, many men declined to join their wives in the pursuit of assisted pregnancy. “I always thought it was such a pity, because had they come a few years earlier when the wives’ eggs would have still been more on the active side, things could have possibly worked for them,” he said. What was more shocking for this gynaecologist was the shameless attitude of some men who, when told that the pursuit of IVF was too late (often due to their own reluctance towards the medical process), would divorce their wives and marry a younger woman whose chances of successful IVF jump from around 20 per cent for women nearing the end of their reproductive life, to well over 50 per cent for women at the peak of their reproductive life. Helping women to encourage their husbands to benefit from medical advances is becoming easier for some in society, but not for all due to persistent misconceptions on what IVF or ICSI is about. Aboulghar agrees that there are misconceptions about the impact of the process on women’s reproductive or sexual health, and that there are also concerns about increased health challenges for IVF/ICSI babies. He acknowledges that awareness raising is necesssary, to explain to a wider segment of society what this process is all about. Then again, when resources are limited, Aboulghar accepts that awareness campaigns on IVF/ICSI cannot take precedence over more pressing issues, like early marriages or female genital mutilation (FGM). Given the "major leaps" of the past 30 years in overcoming unease over IVF, Aboulghar is convinced that in time all fears will evaporate and more couples will be able to overcome their infertility. More and more alternatives and better procedures are now available to help couples conceive. I have tried IVF, and had 2 failed rounds, it was too expensive so we needed to check other options. Tried different fertility treatments and medications before something finally worked, pregnancytips.. Im so happy we found something. We're now proud parents of a beautiful little boy.. It all depends on how your body will react to the prod/procedure and how much your wallet can handle.